On 31 March 1939, Prime Minister Neville Chamberlain told the House of Commons that ‘in the event of any action which clearly threatened Polish independence, and which the Polish Government accordingly considered it vital to resist, His Majesty’s Government would feel themselves bound at once to lend the Polish Government all support in their power.’[ii] The French Government endorsed this pledge. This guarantee was to lead Britain to declare war on Nazi Germany 6 months later. It was welcomed by those who thought Chamberlain had waited too long to challenge Hitler’s aggression in Europe, and surprised those who had not expected him to deviate from his insistence that the appeasement of Europe remained a realistic goal. 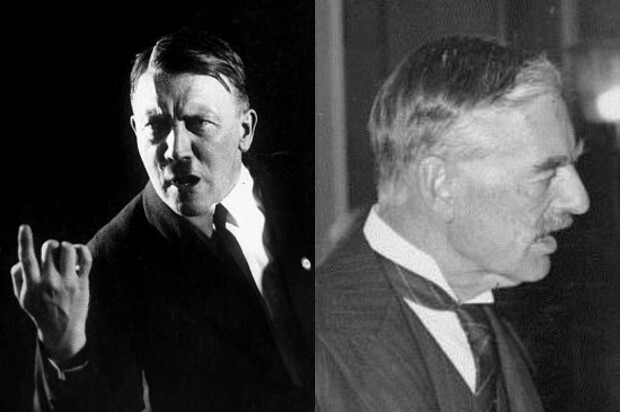 Only 2 weeks earlier Chamberlain pronounced the international outlook ‘serene’, Anglo-German trade talks were planned, and his response to Hitler’s takeover of Czechoslovakia on 15 March was one of sorrow more than anger. Why now pledge the British government to defend Poland, an Eastern European country vulnerable on all its borders? Map of Europe March 1939. 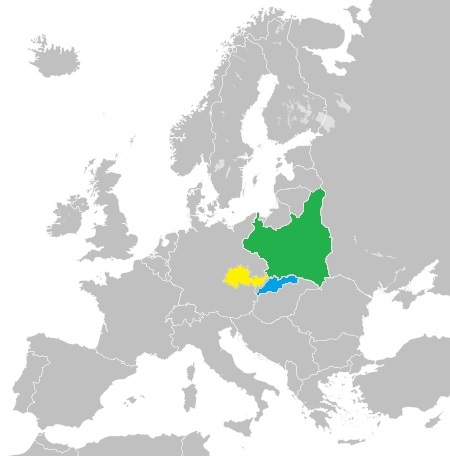 Colour key: Green – Poland, Yellow – Moravia and Bohemia, Blue – Slovakia. Where will Hitler strike next? The US State Department believed Germany would mobilise on the Dutch frontier and demand the cession of the Netherlands East Indies. Since 1934, British rearmament had been predicated on long-term deterrence rather than imminent conflict, based on the Treasury doctrine that economic stability was the fourth arm of defence. By February 1939 this had changed: Hitler’s aggression, the Berlin-Rome-Tokyo axis, Nationalist victory in the Spanish Civil War and the uncertainties of American and Russian policies meant that ‘military strategy was determining economic policy rather than the other way round’. [vi] All 3 armed services were competing for resources and equipment, scrambling to match (exaggerated) estimates of German military might. The one thing the Chiefs of Staff agreed was that Britain would struggle to fight on more than one front at once. But Chamberlain’s attempts to secure the Mediterranean foundered on Mussolini’s ambitions, and British interests in the Far East were threatened by Japanese plans for a Pan-Asian ‘new order’, while the USA urged support for the beleaguered Chinese nationalists in the bitter Sino-Japanese conflict. The military challenges were diverse and demanding. 20,000 British troops were pinned down in peacekeeping operations in Palestine, while Chamberlain’s resolution, however, was confirmed by domestic, as well as international considerations. The public mood in Britain had changed since Chamberlain returned from Munich in September 1938 announcing ‘peace for our time’. [vii] Hitler’s increasingly intemperate outbursts, brutal measures against Jews, and aggressive treatment of Czechoslovakia seemed to even the most inward-looking citizens to be harbingers of war. To those on the Left, the British government’s recognition of the Franco regime in February 1939 appeared a bitter betrayal of the Republican cause, as well as appeasing a pro-Nazi dictator. The League of Nations had proved powerless, and when German forces moved into Czechoslovakia on 15 March, it seemed clear Hitler was determined to dominate Europe. Many people now favoured rapid rearmament, anti-air raid precautions and the building of shelters for which Sir John Anderson had ordered 120,000 tons of steel sheets. They no longer believed Chamberlain when he spoke of peace, and wanted concrete preparations for war. The Prime Minister recognised this. [i] Diary entry by Ivan Maisky, Soviet Ambassador in London, 29 March 1939 (Gabriel Gorodetsky (ed), The Maisky Diaries (London: Yale, 2015). [ii] Parl. Debs, 5th ser., House of Commons, vol. 345, col. 2415. [iii] See Paris telegram 1387 to the Foreign Office, 30 March 1939, printed in Documents on British Foreign Policy 1919-1939 (DBFP), Third Series, Vol. IV, No. 574; and Keith Jeffery, MI6 (London; Bloomsbury, 2010). Pp. 291-2. [v] Berlin telegram 72 to the FO, 28 February 1939, printed in DBFP, ibid, No. 160. [vi] G.C. Peden, Arms, Economics and British Strategy (Cambridge; Cambridge University Press, 2007), p. 172. [viii] David Dilks (ed), The Diaries of Sir Alexander Cadogan 193801945 (London: Cassell, 1971), entries for 20, 30 and 31 March 1939.